Below is relevant information for you to equip yourself for your journey to Boplaas, as well as what you will find when you get there. 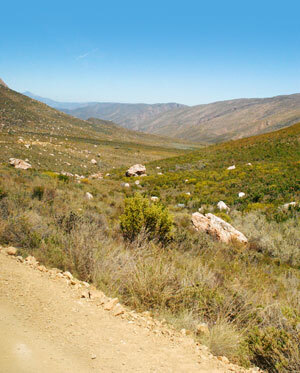 Gamkaskloof (The Hell) represents one of the most hidden-away valleys in SA, formed by the cleavage caused by adjacent iron-ore and scaly sandstone formations in the Swartberg Mountain Range. No wonder that it had been declared a World Heritage Site in 1997 and therefore not to be missed. The road into the valley below follows this cleft in the mountains and therefore is winding, narrow and contains a fair number of passes. It is a trip not easily forgotten: the mountains, gorges, vegetation and clear air bedazzle the visitor. Although the road department always tries to keep the road in a good state, sudden mountain storms can cause it to become quite rough. The first 37 kilometers follows the contours of the mountains, but as the Kloof itself is reached the road forms a winding and spectacular pass leading to the valley floor far below. In the valley the road now passes through riverine shrubs and an abundance of thorn and wild olive trees. History unfolds itself as old dwellings, the old school house and remnants of farming activity is passed. The Gamka River is crossed by a low water crossing and should be crossed with care. Our gate lies right at the end of this road – past Annatjie Joubert’s “Fonteinplaas”, across the Gamka River and past Cape Nature’s “Ouplaas” – a distance of approximately 20 kilometers on the valley floor. We are aware that many visitors reach us by ordinary sedan cars, but we would definitely recommend a sturdy vehicle for peace of mind. When phoning for a reservation, please enquire about the state of the road and weather patterns. It is also not a good idea to try visiting Gamkaskloof on a day trip. Too much time is spent on driving in and no time really remains to experience the wonderful mood of the Kloof. As soon as a booking is made for a particular cottage and payment into the named account is acknowledged, a numbered code is given to the guest. At the locked gate of our farm, this number will access a small locket, containing the key for the gate. This code is changed regularly to prevent unauthorized access. Please return the key again to the locket for the use of other guests! Your keys will be at the cottage on arrival and to be left there on departure. Gamkaskloof lies between the coastal region of SA and the Great Karoo. This causes it to have a below normal rainfall – compared to the Western Cape or George. Summers can be quite hot, but the perennial stream on the farm, indigenous trees and the farm dam provide enough to cool off! Winter days are exceptionally mild to warm, but the nights can get quite cold. Clothing and footwear that is appropriate to envisaged hikes and walks. Remember that “kloofing” up the mountain stream might force you into the stream at several occasions. Some warm clothing for evenings and at night. Towels. Soaps and shampoos. Toiletpaper is provided. Extra blankets, if visiting in wintertime. Torches and individual lighting (for reading)—if required. Blitz and matches. Extra tea candles and lamps, if needed. Food and drink, as needed. Some fridges are gas driven and will not freeze unfrozen food. Black “Potjie”, for potjiekos, if needed. Camping chairs, for outside use. Wood is available to buy on request. Binoculars, cameras and personal effects. There is NO mobile reception in the entire Kloof. Several hiking trails are available for exploration on Boplaas Guest Cottages. The most famous of these is the Ladder-route. No outsiders are allowed as day visitors. However, there are also a few other exceptional routes, which truly allows the visitor to really appreciate the total seclusion and expanse of this part of the Swartberg Mountains. At Boplaas Guest Cottages the entire property is for the exclusive use of our guests and being 4,000 hectares large, can offer an enormous variety to everyone’s interest. The pools in the riverbed next to Kleinbergkop are rather shallow, but some do allow you to cool off in. At some of the cottages small cool-off pools have been built. Visit all the ruins and dwellings on the farm and indulge in the history and life on the farms in the olden days. Try and find some of the old fields that remain uncovered next to these ruins. Explore the mountain sides of the valley. Artifacts of earlier inhabitants, like the Koi and San have been found by visiting archaeologists and to the keen observer this is truly possible. This is of cause high on the agenda and over 150 species have been identified in the Kloof. Because of the tranquility, remoteness and lack of vehicles on our property, bird spotting is relatively easy and an excellent way to while away a lazy afternoon. Drive to Cape Nature’s information centre at Ouplaas for a truly interesting visit. They have gone to good lengths to provide comprehensive information regarding fauna and flora, history of the Kloof and general enquiries. Bird lists can be acquired and they have a variety of souvenirs for sale. Permits may be obtained to visit and hike up or down the Gamkariver. Lastly, you can book a dinner at the Kiosk and restaurant at Fonteinplaas, back at the start of the Kloof. Be aware it is quite a distance from Boplaas, especially late at night. Bookings will have to be made in person on your way in. A small but very well-stocked—albeit quite busy—shop is run by the Jouberts. Cold drinks and even alcoholic drinks can be bought.